I have something I’m so incredibly excited about that I barely have the words. Joey Roth has been one of my artistic heroes since I first discovered his work. His prints hang in my office and I look at them every single day. We first met a few years ago when he randomly emailed me about books and we were going to try to get drinks but the scheduling didn’t work out. My blog was very small then and I just thought he was some nice guy that I would occasionally chat with. I remember very vividly sitting at the porch of Dov Charney’s house reading the New York Times and seeing the name Joey Roth in the design section. How cool is this, I thought? I bought his first poster about hustling when it came out. So it feels very fated that we would one day collaborate on something. It’s even cooler to me that the collaboration involves one of his famous prints and our mutual fascination with stoicism and strategy. This very limited edition print (only 1,000 are being made) is loosely inspired by the stories in The Obstacle Is The Way about Grant’s siege at Vicksburg and Eisenhower’s turnaround at Normandy. It’s the timeless idea of how military obstacles can be turned into advantages–and how advantages can so quickly be turned against someone. It took a lot of iterations to get it right and I think we did. 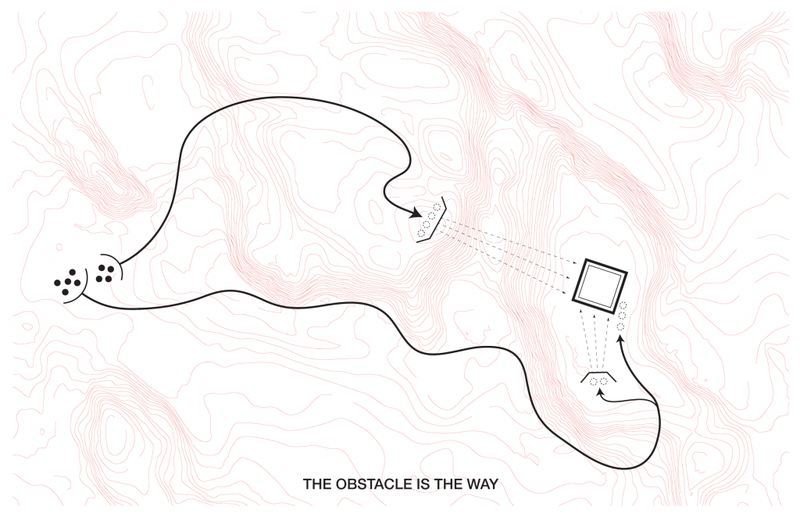 In other words, the obstacle becomes the way. And conversely, the fortress becomes a prison. It’s something I try to think about constantly and now this print is a daily reminder in bright color. It’s very easy to say something in words in a book (or in a blog post), but communicating it visually is another story. I think that’s what makes Joey so unique. I hope you like this poster and I hope it helps with your obstacles. I’m having a bit of a hard time deciphering this. So the obstacle is the square object which is an allusion to the entrenched competition. Then the different points maneuvering are trying to make their way to the competition’s level. Some make it and others don’t it seems. Where I’m scratching my head is I’m not sure why the obstacle seems to be the end goal. You’ve heard of a fort right? 9 men start out behind a hill. The 4 men in team one depart to the northeast to set up armaments across the gorge. The 5 men in team two depart to the east. Team one starts to bombard the fortress from the west. Team 2 sets up armaments to bombard the fortress from the south. Inside the fortress they scramble to address the threat to the south. Just then 3 commandos break off from team 2 and storm the back door, capturing the castle and their heavy artillery. Looks interesting, but will only appeal to those who care about strategy. It’s a small market. wha… What do you mean small market? I must be in the wrong hustle! The arrow farthest right is penetrating the fortress from behind. What are the two barriers the other arrows are hitting? The arrow farthest left seems to encounter a huge cliff as shown by topography lines. The arrow in the middle ecounters What? Enemy fire? I’m assuming the dotted arrows represent distance that can’t be covered. Congrats on 3 bestsellers that’s an awesome feat at 27.
poster: looks like women’s boobies. on left where eye first gleans. I don’t think this design does justice to the book and many of the powerful messages from the stoics that the book encapsulates. It tries to simplify something too profound. If this is based on historic military maneuvers then it should use standard military operational terms and graphics. I just got my copy, love it man it looks great, it’s an awesome reminder to see every morning. Appreciate all your and Joey’s hard work. Growth Hacker Marketing: The Course!